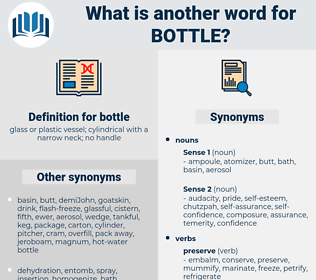 What is another word for bottle? booze, receptacle, lamp, pot, canister, wine. bottleneck, quart, glass, tube, jar, vase, cylinder, specimen, liquor, old-timer, boat. impotence, ineffectualness, cravenness, cold feet, cowardice, softness, spinelessness, feebleness, hesitation, cowardliness, faintheartedness, weakness, poltroonery, dastardliness, indecisiveness, mousiness, timorousness, fearfulness, indecision, timidity, irresolution. Until then, perhaps a hot water bottle will help. Give me that bottle, if hands you have; what is the use of Counsellors? 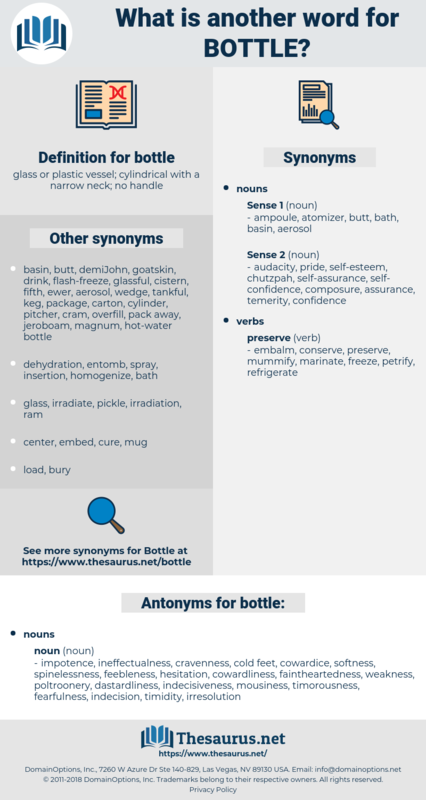 beer bottle, calabash, cruet, inkpot, decanter, gourd, ink bottle, carboy, flask, demiJohn, ampoule, whiskey bottle, vial, phial, smelling bottle, carafe, crewet, specimen bottle, catsup bottle, pop bottle, wine bottle, ketchup bottle, pill bottle, jug, ampul, ampule, soda bottle, water bottle. place, pose, set, put, position, lay.